The northern half of the 525-acre Natural Education Reserve includes the short Fox Den Trail, and Sabin Pond and Beaver Pond Trails which merge into each other and are anchored by the Boardman River Nature Center. The Boardman Pond Trail is covered in the southern half of the Reserve along with the Keystone Rapids Trail and the barrier-free Lone Pine Trail. 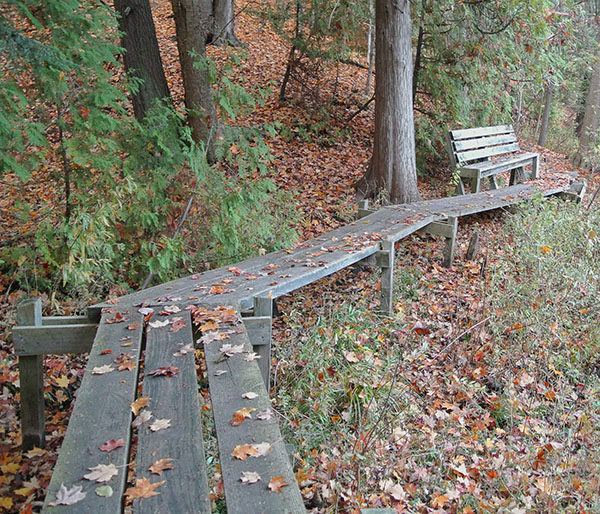 When it comes to hiking in the fall we prefer trails with boardwalks and planking and wooden stairways and bridges. They allow you to focus on the changing colors while walking through marshes and along ponds, ensuring your boots stay dry and your feet warm during an otherwise chilly time of year. 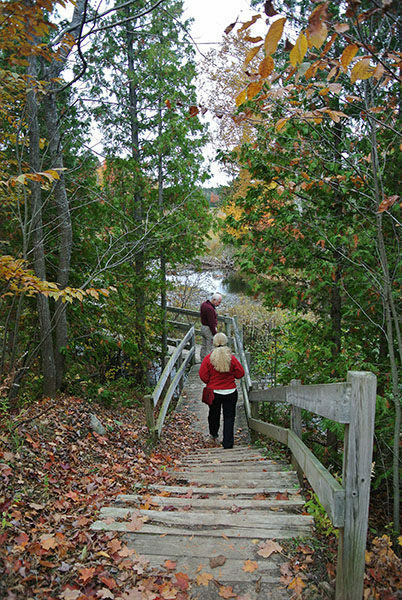 The Grand Traverse Natural Education Reserve has both. 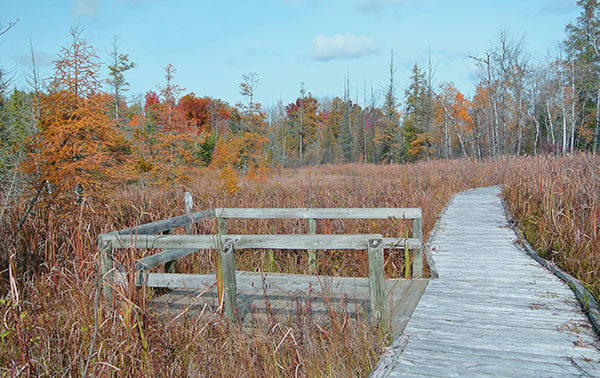 The 525-acre reserve has 7 miles trails with lots of boardwalks, one more than 900 feet long, and 19 sets of stairways along with lots of marshes and ponds in an area of the state that has lots of color in October. 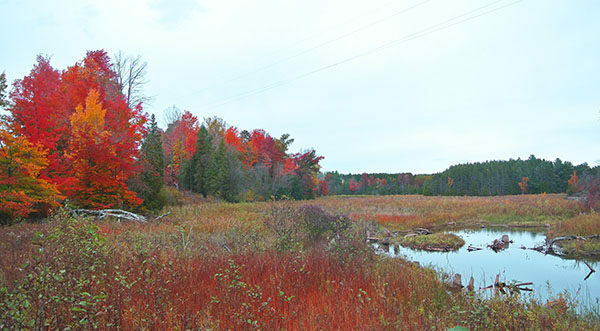 Within the long, narrow park are a marsh, swamp, level terrain, upland forest, pine forest, creek, river, and an active beaver pond. The various habitats are home to beaver, otter, mink, fox, deer and excellent birding. Best of all the area is only 3 miles from downtown Traverse City. So close yet so diverse. The Boardman River is the central feature of the reserve and at one time Consumers Power owned three abandoned dams along it. When the one of them, the Keystone Dam, washed out in 1961 Consumers Power offered to sell the entire area, dams and all, to Grand Traverse County for $1. The county accepted the offer and in 1976 the park was officially dedicated as a "natural environmental classroom," an area that is used today by local schools to teach botany and biology. 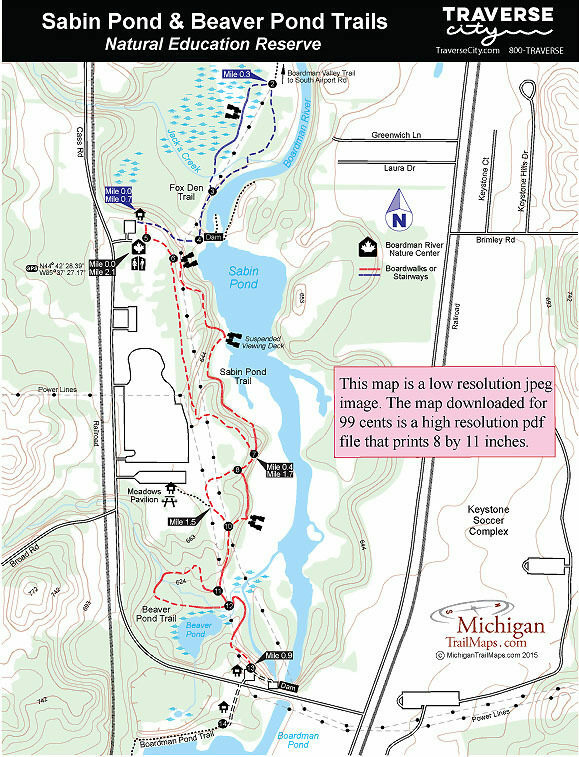 The park’s trail system borders Sabin and Boardman Ponds as well as the Boardman River and is accessed from six trailheads. The majority of the paths are linear trails - you backtrack to return to your car - as there is only enough room for a few loops. And a break in the trail system around Boardman Pond essentially separates the Natural Education Reserve into two parks, preventing visitors from traversing the length of the property. The northern half of the reserve includes the short Fox Den Trail, and Sabin Pond and Beaver Pond Trails which merge into each other and are anchored by the Boardman River Nature Center. The Boardman Pond Trail is covered in the southern half of the Reserve along with the Keystone Rapids Trail and the barrier-free Lone Pine Trail. 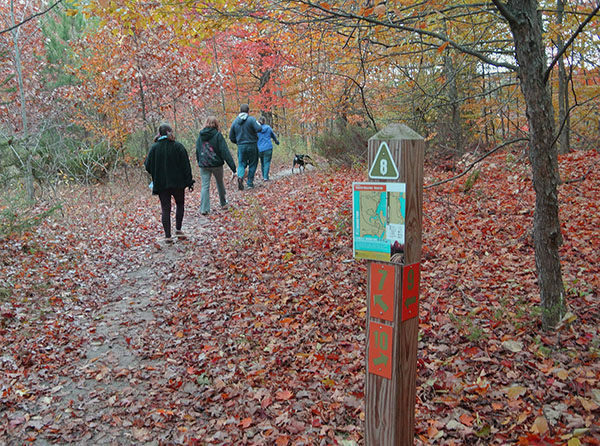 Although labeled as two trails, Sabin Pond and Beaver Pond are usually combined for one the best loops in the Reserve, a 2.1-mile walk from the nature center to post No. 13 on Cass Road and back. The loop, along with a visit to the nature center, makes a great outing for families due to all the boardwalks, stairways and viewing deck embedded in the trails. Outside the nature center, near a picnic pavilion, is post No. 5 with a trail heading south that quickly reaches post No. 6. Just beyond the post is the first viewing deck, providing an overview of Sabin Pond and the dam that created it. You skirt the bluff briefly and then descend a long stairway to an incredible observation deck suspended over Sabin Pond with cables and reached at Mile 0.2. The Reserve staff calls it the "mini-Mac Suspension Bridge" and kids love it. Boardwalks and stairs follow topping off at post No. 7 at Mile 0.4, where one trail loops back north (right) to the nature center. The other heads south (left) quickly reaching post No. 8, the start of Beaver Pond Trail. Continue south (left) to scramble down another long stairway followed by an elevated boardwalk and more stairways before topping out at the third viewing deck of this short hike. Post No. 10, in the open power line corridor is reached just past at Mile 0.5. Continue south (left) and a series of three stairways bottom out at post No. 11. Post No. 12 is just beyond it and marks the start of a scenic stretch where a long boardwalk winds through a marshy area and across a stream before climbing to post No. 13 and the trailhead on Cass Road. To return, backtrack to post No. 12 and hang a left at every posted junction to hike the three loops off the main trail. The first, the quarter mile segment from post No. 12 to post No. 11, is by far the most interesting. A long boardwalk crosses a stream and then skirts the Beaver Pond, providing an excellent vantage point to look for wildlife. Another boardwalk over a stream and more stairways follow before you return to post No. 11 at Mile 1.3. Backtrack to post No. 10 and then head left at the junction for the next loop. Along this loop is the access trail from Meadows Pavilion, a picnic area. Most of this loop as well as portions of the next from post No. 7 to post No. 6 are in the power line corridor, making them less appealing. To avoid the corridors, simply retrace the trails along Sabin Pond, enjoying the views from the observation decks once more. The Fox Den Trail forms a short loop that begins in the parking area of the Boardman River Nature Center. A stairway and a dirt road descend to the Sabin Dam and post No. 4. The trail then heads north (left) to skirt the Boardman River and quickly arriving at post No. 3. To the left at this junction the trail crosses Jack’s Creek and follows the 900-foot boardwalk through a conifer swamp and emergent wetland with a viewing deck in the middle. To the right the trail continues to skirt the Boardman River. Both meet at post No. 2, marking the junction with of the Boardman Valley Trail that heads north to reach a trailhead off of South Airport Road in 1.3 miles. Returning from post No. 2 to the nature center makes for a walk of 0.7 miles. Information kiosks are located at most of the trailheads. At the Sabin Pond Trailhead is the Boardman River Nature Center. Built in 2008, the Nature Center offers an interpretive gallery with live animals and rotating exhibits that change with the seasons and focus on Michigan’s most interesting fauna and flora. The Natural Education Reserve trails are open year-round but are not groomed for cross-country skiing. The Boardman River Nature Center is open Tuesday through Friday from 10 a.m. to 4 p.m. and on select Saturdays. There are no fees to use the trails or visit the nature center. From South Airport Road in Traverse City turn south on Cass Road and follow it 1.8 miles. The posted entrance to the Boardman River Nature Center will be on the left.